Matching principle is an important concept of accrual accounting which states that the revenues and related expenses must be matched in the same period to which they relate. Additionally, the expenses must relate to the period in which they have been incurred and not to the period in which the payment for them is made. For example, a company consumes electricity for the whole month of January, but pays its electricity bill in February. So if the company has been operating under “cash based accounting”, they may have recorded the expense in the month of February, as it has actually paid cash in February. But under “accruals accounting” the entity is bound to record the electricity expense for the month of January and not February, because the expense has originally been incurred in January. Matching principle is one of the most fundamental concepts in accrual accounting. In simple terms matching concept means, in relation to a given time period, the expenses that are recorded in the financial statements of a company must be related to the revenues generated in the exact same period. This treatment of revenues and expenses makes it sure that the whole effect of a transaction is reported in the same corresponding reporting period. Another aspect to consider is that, when both the revenues and the expenses must be recognized? Revenues recognition: For a company, revenues must be recognized when the entity is sure that it has earned those revenues by fulfilling their part of agreement and that the other party will also fulfill its duty in terms of payment. Expenses recognition: Expenses must be recognized when they are incurred and the revenue connected to them is recognized, irrespective of the outflow of cash or its equivalent. A company has a policy to pay a bonus of 1% on its sales in a quarter, to every single sales representative. Now if the company has 4 sales representatives and each of them secured sales of $100,000 in the first Quarter of the year, each of them earned a bonus of $1000. As there are 4 of them the total bonus expense to be paid by the company would be $4,000 (4 × $1000). 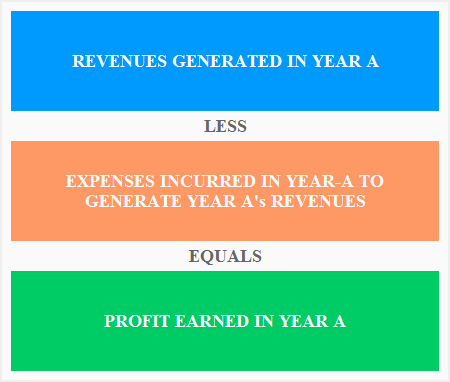 If for instance the company paid the bonus in the month of may which falls in the second quarter of the year, the matching concept requires the company to record this expense in the first quarter and not in the second quarter, because this expense relates the revenues generated in the first quarter. A Law Firm pays $4,000/month fixed salary to 6 of its consultants. The same Law Firm earned revenues of $230,000 and $180,000 in June and July respectively. The expense for the two months would be the same $24,000 ($4,000 × 6) as the salaries are fixed. But the profits for the months of June and July would be $206,000 ($230,000 – $24,000) and $156,000 ($180,000 – $24,000) respectively. This is because the salaries expense is matched to the revenues generated for the individual months. This is because a business cannot generate sales or revenues without incurring expenses like cost for raw materials, marketing expenses, selling expenses, administrative expenses or other sundry expanses etc. and so only reporting revenues for a given period without showing the expenses that were responsible to bring those revenues could alter the face of financial statements by either overstating or understating the profits of a company, thus resulting in wrong decision making by the end user of those statements.